The logistics and supply chain sector forms a huge part of the UK economy and, in return supports a plethora of other businesses, of all sizes across many sectors. From supermarkets to retail outlets, corner shops to ecommerce retailers. 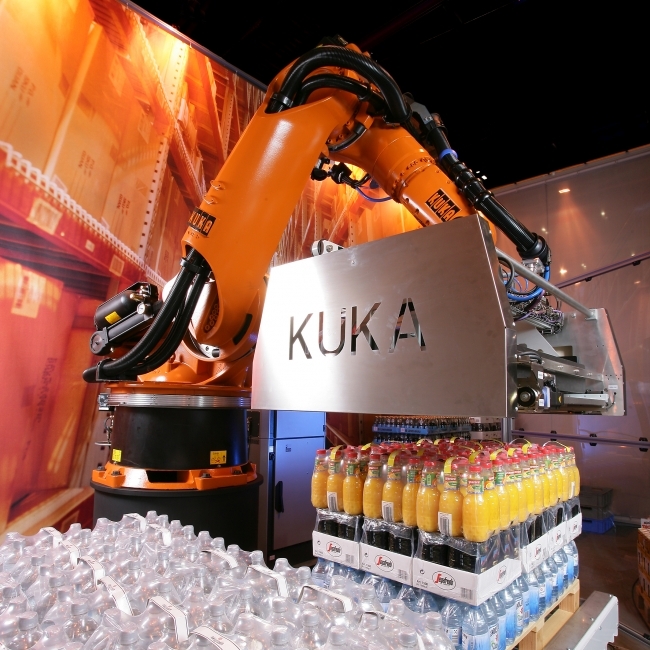 As consumer demand increases, aligned with the UK’s population growth, KUKA Robotics looks at the incremental demand placed upon the logistics and supply chain market – a demand which dictates that business owners must review operational processes to ensure that they are best placed to manage predicted explosive market growth, in what is fast becoming an extremely competitive arena. Considering market growth and increased consumer demand, it is only logical to assume that automated robotic processes shall increase in their adoption within the logistics and supply chain market, to attend materials handling tasks, such as picking and packing and palletising. Such is the competition being faced by business owners, especially SME’s, the need to react efficiently and effectively to changing market trends is imperative to commercial success. Small firms have smaller profit margins, compared to larger corporate businesses with larger logistical infrastructures, sometimes as low as 1-3% and, any actions that can improve productivity will result in cost reductions which can then be channelled back into the business. Investment in capital or further investment in automated processes. Ultimately these cost savings will eventually be passed on to the customer, allowing businesses to maintain a competitive advantage. By implementing automated robotic applications within a supply chain, manufacturers are able to diversify their operations. Ecommerce dictates that products are available to consumers to order 24/7 and keeping up with demand is critical. Though the costs associated with staffing a supply chain operation aligned with a 24 hours a day, 7 days a week, 365 days a year ecommerce presence, is costly. Finding employees with the right skill sets who are willing to work unsociable hours is a challenge, not to mention the costs associated with compensating said employees, by way of expensive shift allowances. This is where business owners should consider investment versus return, when contemplating the implementation of automated robotics and how by future proofing their operations, they can continue to be of value to their customers in the future, by providing a service that shall not become obsolete and minimise the effects of obscure market trends. There is a misconception that robots are taking jobs. This is not the case. In many cases robots are undertaking tasks that are either too dangerous or stressful for humans to complete within a manual handling application. Consider bending, lifting, twisting, pushing, pulling. Actions all necessary within a manual handling environment. Operators who might have once undertaken such rigorous tasks can be upskilled to robot programmers or, be placed elsewhere within an operation where they can make best use of their skills and qualifications. Providing cost savings, adding value and promoting job longevity away from non-ergonomic tasks. Implementing automated robotics can even attract a higher calibre of employee, experienced in HMI (human machine interface) and the management of automated systems and robotics. The primary skills that are needed to fulfil traditional, industrial tasks, are no longer deemed as desirable to our millennials, who don’t want to work in many of the key industries that drive the UK economy. Technology has significantly changed the materials handling environment of even a generation ago. Modern logistics and supply chain environments of today will require an unparalleled degree of technical awareness. Consider software and integrated hardware solutions (robotics). The age of digital transformation is here and the evolution of the retail ecommerce market dictates that business owners must invest in the right tools to keep up with sector growth. Lost productivity can be the difference between sink, or swim and, in order to maintain a competitive advantage in the UK’s ‘real-time’ economy, businesses must incorporate data driven automation into their organisational structure and business strategy, in the context of Industry 4.0, the Internet of Things (IoT), cyber-physical systems, emerging technologies, advanced data analytics and semi-autonomous decisions enabled by Ai (artificial intelligence). Optimising operational efficiency is key, especially so now manufacturers are utilising IIoT (industrial internet of things) technologies to enhance operational processes, such as materials handling, to provide an on demand service model to their customers. With this in mind it is difficult to grasp just why there does still exist a reluctance to embrace automated robotics as an operational value-add. Economically it makes sense. Operationally more so.